I think we're pretty much settled on our little flock of chickens. They are about 17 weeks old now, and were too many in number for the size coop we have. 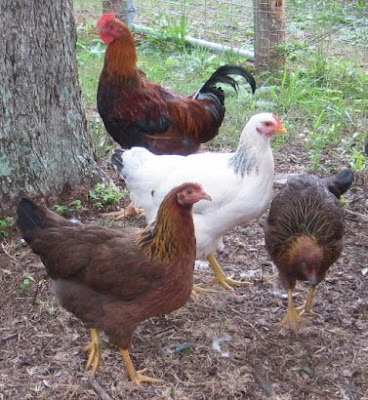 Originally I ordered 24 straight run chicks, six each of four different breeds: Ameraucana, Delaware, Barred Holland, and Welsummer. We lost 5 chicks within the first week. That left 19 to raise, of which 12 turned out to be roosters, and 7 hens. Mathematically (if you're in to that sort of thing), that comes to about 63% males, rather than the hoped for 50% or less. 1 lost as a chick due to an accident. Now. This is the rooster ya'll (we have 3 remaining), Lord Barred Holland. He is alert, watchful, inquisitive, but not aggressive. I've never seen him challenge any of the other cockerels, but neither does he take any stuff from the one's who've challenged him. Nor will he let them pick on the pullets. He's the one who clucks when something approaches the chicken yard. He's always the first one to come see what's up (along with Lady Barred Holland, so inquisitiveness may be a breed trait). He accompanies me when I'm in the chicken yard and comes to inspect my progress when I do my chores in the coop. I do not attribute this to friendliness; he simply knows that when I show up, food and treats usually do too. I keep my eye on him however, just in case he becomes too bold and thinks he needs to challenge me, as keeper of the flock. He won't let me pet him, but I have picked him up on several occasions with only a minimal of fuss. So, the state of the coop is currently ten: 7 pullets and 3 cockerels; the nine culled cockerels in the freezer. Ten seems a small flock, after having nearly twice that number for so long. Still, it's nice not to have the squabbling and noise. It's nice to not have greedy bullies (of which we had several) in the chicken yard. It's nice to not have to buy so much feed. The next step will be getting ready for eggs. More on our 3R nest boxes soon. 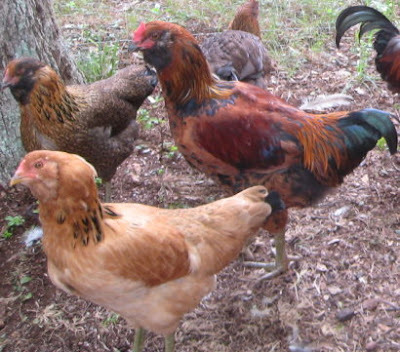 Oh, your flock is shaping up nicely, and what a handsome rooster. I was traumatized by my father's chickens when I was a little girl, so am content to buy eggs from my neighbor. I still appreciate what beautiful birds they are. What a lovely flock, and your main roo is a very handsome fellow! 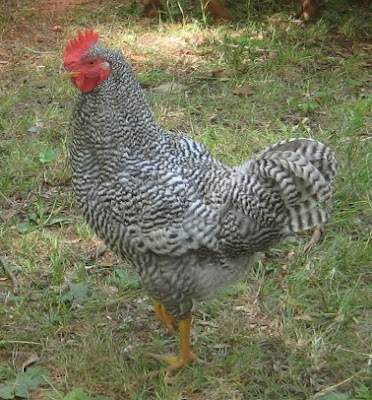 I know nothing about chickens, but from your pictures, I'd go for your Barred Holland as boss. I like the look of the Delawares and Barred Hollands. Sounds like you've got the right priorities for your Roo. I've heard lots of stories about nasty roos. I will be quite happy when our flock is down to 11 pullets. Not that the boys are a huge problem, but being a dual purpose heavy mix, they are much more active than the hybrid meat birds and I'm getting tired of them sparring. When they're gone, the girls will have a nice big pen, without the hassles of the roos. not being a person who knows anything about farm life I had to look up culled. I had a pretty good idea what it meant, but ya know to double check. sounds like things are going well. Any idea how long until you get some eggs? I have a friend who's best layer just died. They think she might have had an egg crack inside her. One of her other hens stopped laying about 3 months ago. I told her that I would cook that one up. Sharon, the roo's being handsome is an added bonus. I can understand that about chickens. I know a lot of folks say they can be friendly and make good pets, but I haven't seen that in any of our four breeds. Mary, we came to the same conclusion. Dan liked him for his looks, so I'm delighted that he has the qualities of being good at his job too. Nina, I've heard those stories too so I was hopefully very careful in which ones we culled and which one we left. I agree with you about the sparring and feel fortunate that none of ours actually hurt or killed one another. Yes, the Barred Hollands and Delawares are handsome chickens. Their coloring compliments one another nicely. Renee, good for you! "Culling" is a more of a breeding term I suppose. I believe most chickens start laying anywhere around 20 to 24 weeks old. For us, that means we could start getting eggs in about a month. 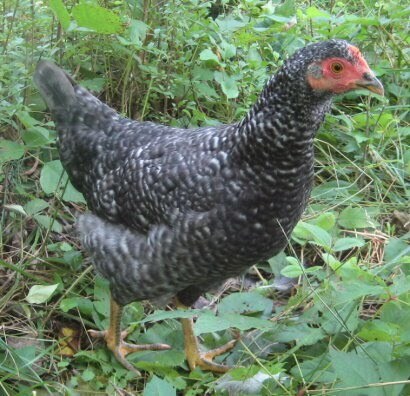 Most hens stop laying annually when they moult. That may be the case with your friend's hen. 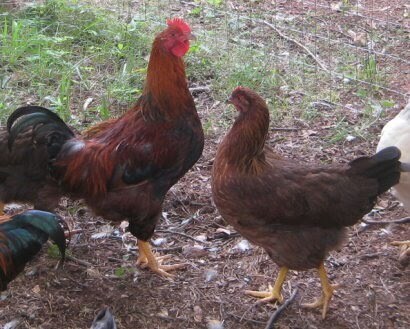 Some folks replace their chickens at this point, because the older they get, the fewer eggs they lay. I've read that some hens can lay for 10 years or so. Not sure if we'll find that out first hand or not! Your chickens are lovely! I like that you have different sorts. They all look great! 10 is a nice size flock for all the reasons you stated. Lord Barred Holland is handsome, Barred rocks are my favorite chicken breed (so far). They have a such neat personalities. Ten sounds like a nice sized flock! Any more and you will be drowning in eggs and spending way too much on feed! Leigh, your flock is very pretty! I admire you for not getting too attached to your birds. Our pullets started laying at 16 weeks. I was surprised. And it was during the middle of winter, too. I am also surprised how many cockerels you had. Are you going to keep the 3 remaining cockerels? Charlotte, and the best part is that each breed lays a different color egg! Leslie, I'm wondering if the Barred Hollands and Barred Rocks are the same in their barring. Mine seem to be typical of their breed, with the females darker than the males. I still don't know the difference between breed and individual personality traits. Yet. It's fun to learn though. Laying at 16 weeks?! Gosh Lynn, I'd better get my nest boxes installed pronto. Yes, the plan is to keep the three remaining cockerels, but it depends on how well they get along. Yesterday I say the Welsummer and Lord Barred Holland in a face off, twice. I believe the Wellie instigated it, but I'm not positive. He isn't a very good rooster candidate anyway. He prefers being in the coop or yard, and is the first to run if anything scary comes along. Actually, I'm surprised he'd be a challenger to any other roo. But who knows. I'm just so jealous of your chickens I was so hoping that we would be able to have some. But I'm still not sure if in the area I'm in if our city will let me. 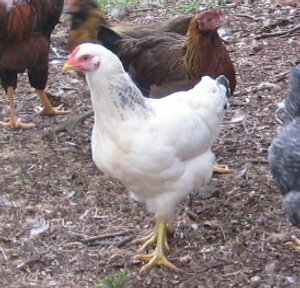 Many places allow a limited number of hens to be kept as pets, three is common. And if you have the gumption, you can always work to get the law changed. Actually 10 is a nice size. Once you start getting eggs, you'll have plenty to eat and preserve. Those Welsummer chickens are beautiful!!! I think you're doing well. You got a bit of a bummer percentage with the m-f ratio, but it is working itself out. The birds look lovely and healthy. The state of the coop over here in Dunedin for us? MUDDY. We had one solid week of rain, floods everywhere - although our property, being on a hillside, avoided those, thank goodness! But the poor chooks are still in a bit of a mud pit. I don't know what to do. I can't clean the chook house out, because that would just mean shoveling bucketloads of mud (it's an earthen floor) which is a bit pointless. I've laid down bales of hay, which are soaking it up a bit, but things are still sloppy and wet. And it is STILL raining far more than normal. Can't wait for Spring. And we're not even at Midwinter yet. I'm guesstimating that I'll get about 3 dozen eggs a week of so. I'll be interested to see, at the end of a year's time, how well this number will do. Hopefully I can freeze enough for use when they aren't laying. We'll see! Daharia, what a mess! And to think I lamented having a concrete floor on our livestock shed. I don't know if you're familiar with it, but I have found the deep litter method of coop keeping to be wonderful. We've had our chickens 4 months, and I have yet to clean out the coop. Don't plan to until fall, when we'll till it into the garden. There's no smell and no mess. The "secret" is small particles of materials that can be kept easily stirred up. I can use a lot of our raked up leaves, so it's cheap too. I'm absolutely sold on it.